Cody Bottorff | Beer Blotter: Seattle based. World focused. Visit: A Sunday day trip to Beervana, U.S.A. Our very first of many beer related stops of the day. What can I say, it's beautiful. Food Options: Small plates/appetizers/soup/salad/sandwiches. The owners wanted the Barrel House to be open to families with children, so local law states that food must be served to allow for those under 21 to enter. The menu is fairly small and simple, but if you need a nibble whilst sampling the stellar brews, the option is there for you. Considering that almost all of the sours are in the 8% to 12% range, a little substance in the belly is highly recommended. Our visit did not include food, so we are not able to comment on the quality. BAR OPINION: About a year ago, when Beer Blotter first heard that one of our favorite sour brewers in America would be opening a brand new tasting room in Portland, we all just sort of looked at each other with wide eyes and growing smiles and knew that we would be there as soon as it opened. The simple reason: Cascade Brewing is just downright exciting. This brewery exists in a niche of State Side breweries that is occupied by a very elite few. An elite few that have the know-how and brewing facilities to allow for mass production in purposely infected beers. Sours. This art is not for the faint of heart, especially for those that also brew “traditional” ales and lagers that could easily be tainted with all those hazardous bugs crawling around. If you’ll allow me to speak for all North-westerners for one moment, it feels really good to have a brewery that is unafraid to tackle this challenging but incredibly rewarding style of production in our own backyard. An Oregon brewer that can be spoken in the same breath as Russian River, Jolly Pumpkin, Avery, Allagash, New Belgium. It feels good…a pleasant sigh of relief. Cascade Brewing’s brewmaster is Ron Gansberg. That name should be remembered. Not my ideal use of a barrel, but still pretty clever. The Barrel House opened its doors to the public on September 27th, and less than a week later, all three of us were inside. Let me tell you, we had the highest of hopes for this place, and we were not disappointed in any way. From the outside, the building, which used to be a produce warehouse, looks a bit like one of those newfangled fire stations. Very sharp-looking indeed. 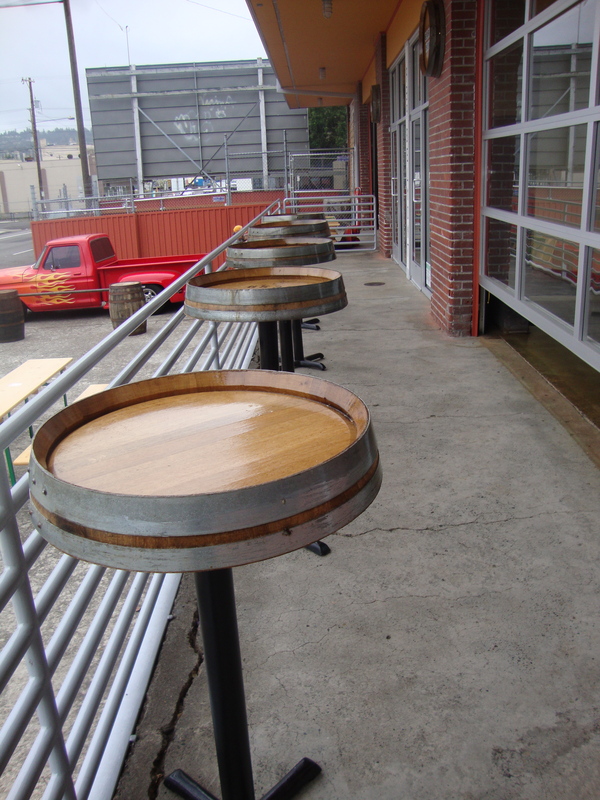 There is a very sizable outdoor area that offers both picnic tables and high-top tables fabricated from steel and actual wood barrels (see picture). The seating is fairly similar inside, consisting of picnic tables, traditional booths, small circular tabletops resting on top of large barrels, and brushed metal bar stools. If you are able to peel your eyes away from the alluring bar back for just a moment, you will notice the three flat-screen T.V.s strategically placed around the room. Naturally, we wanted to be as close to the beer as possible, so we pulled up a few stools at the bar and got acquainted with the menu. We were quickly greeted by one Cody Bottorff, Pub Keeper/Blender. This was my first time meeting Cody, but the rest of the crew had met him a little while back when he was still at The Horse Brass. He was expecting us, so after a short bit of banter and the choosing of beer number 1, we had the distinct pleasure of getting a tour of the facility. Our first stop was the beer cooler, directly behind the bar back. This little gem has been meticulously constructed to make your beer experience as good as it possibly can be. To put it simply, the temperature and CO2 pressure regulation is painfully exacting. You can always be assured to get a perfect glass of beer. One small example of how much care went into the development of the cooler is that they went as far as to assure that the water used to clean the glassware prior to the pour is the same temperature as the beer. The most fascinating element of this leg of the tour was the sight of the two barrels that have been inserted directly through the cooler wall. Yes, that’s right, they cut two circular holes in the wall and stuck barrels in them. 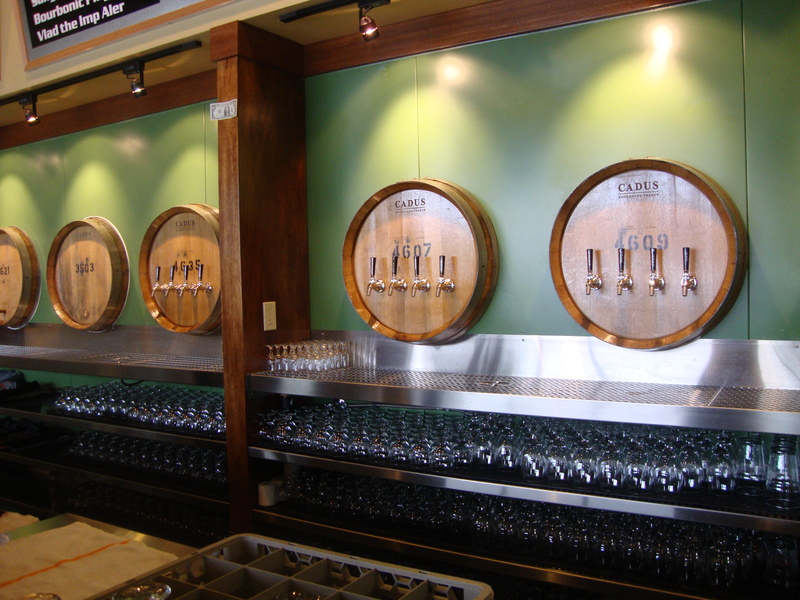 This allows for two special beers to be served to the public directly from the barrel. This is freakin’ sweet! They used the tube of a bike tire to insulate the space between the wall and the barrel. That’s some real deal MacGyver action right there. The next stop of the tour was the space that will soon act as the fruit infusion/secondary fermentation site. Remember, this place is still really new and there is still work to be done behind the scenes, thus my use of “soon”. 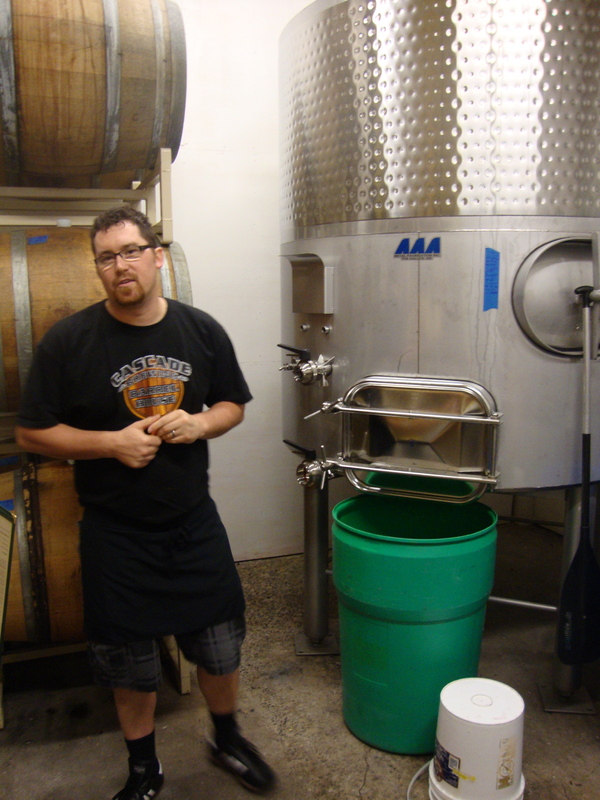 We then ventured to the small side room that is currently housing the fruit infusion/secondary fermentation. Though this room was fairly boring to actually look at while we were there (just a few barrels and a few recycled dairy fermenters), it was captivating to imagine what it must look like when they are filling the containers with outrageous amounts of fresh fruit. Or even, what it must smell like when there are hundreds of pounds of Bing and sour pie cherries, apricots, raspberries, blackberries, dates, etc. being generously dumped into oak barrels. I very much wished that I had x-ray vision and could see what wonderful fruity delights existed within those vessels. 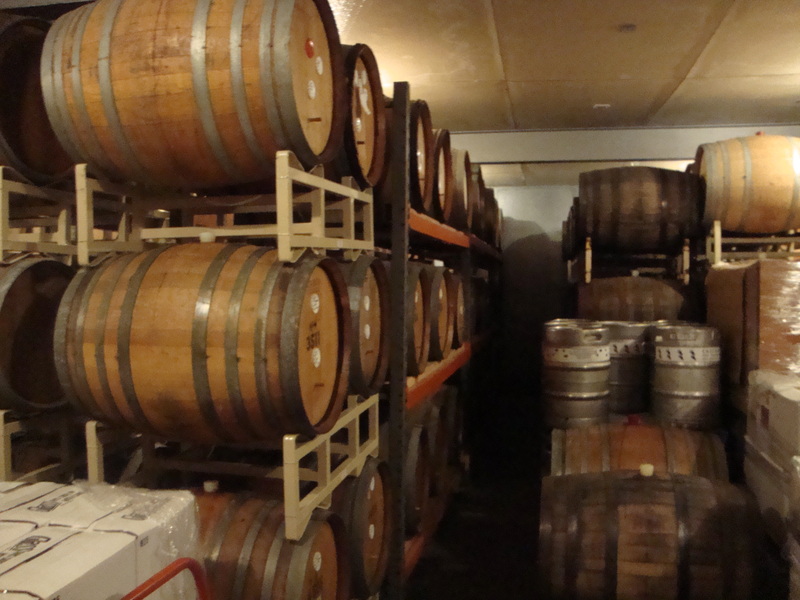 The final stop in the tour was the barrel room. This was a sight to see. I can’t even tell you how much this room reminded me of Belgium, specifically the attic at Cantillon in Brussels. Oh man, I’m getting emotional just thinking about it again. All I can really say is, there is a little piece of one of the greatest beer cultures on the planet hidden in the back room of the Cascade Barrel House in Portland, OR. From here it was back to the bar for more beers, but first, further reflection on our first round choices. For me, the Funk III was an absolute must. This was the one ‘straight from the barrel stuck in the wall’ option. Naturally, it was still un-carbonated, but it was chilled just as much of the rest of the beers. For me, this had a very strong traditional Belgian gueuze like quality. Maybe the lack of suds brought this thought on, but it was damn good and again, sent my memory reeling with thoughts of the Belgium trip. Any beer that causes that to happen is a winner in my book. Nightfall and Noyeaux were also sampled in round 1. Nightfall is an oak aged sour blonde wheat beer with blackberries added. If that doesn’t sound good to you, you probably should have tuned out a long time ago. If you aren’t into fruit beers, it doesn’t matter, there is so much more to it than that. But, if you really want to talk about complexity, Noyeaux can pretty much be used as a synonym. This one-of-a-kind NW sour is a blend of Belgian strong blondes aged in white port barrels with raspberries, then blended with select barrels of strong blondes that were aged on the toasted meat from the apricot nut, or Noyeaux. Noyeaux has so many layers of brilliance that I don’t know where to begin. I’m not going to allow this article to turn into a Notes of a Beer Nerd so you’ll just have to trust me when I say that it’s breathtaking and that you must go get one for yourself. Our next round saw us order four beers to be sampled amongst the three of us – Beck Berry, the one and only Brett beer that they make/will ever make (apparently Ron gave it a whack and decided that once was enough, he uses Lacto), and the three bourbon barrel aged beers: Bourbonic Plague, Vlad the Imp Aler, and Sang Noir. I have, ever since it won gold at GABF in the wood and barrel aged sour beer category in ’09, been hoping to try Bourbonic Plague. It is a very hard one to get a hold of. Well, it finally happened and it did not disappoint. Truthfully, none of the beers disappointed, but Bourbonic Plague, of all the beers sampled, most played to my tastes. It’s essentially a sour imperial porter with strong bourbon wood notes and some spicing. Just plain insane. Just before we made our way to our next destination we realized that it was completely dumb of us to leave without tasting the Fresh Hop Porter. You know, because it’s a fresh hop porter…who makes that?! Guess what? It was delicious. Go figure. 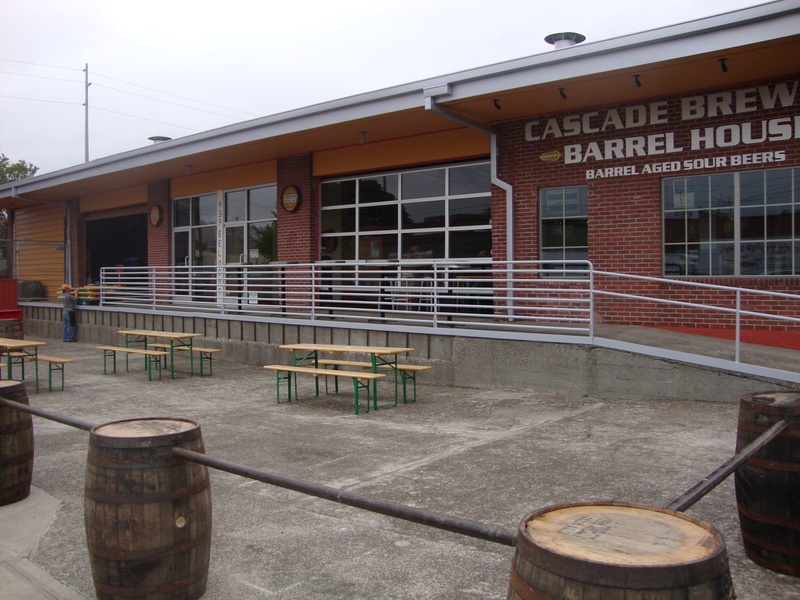 Seriously people, Cascade Brewing Barrel House is well designed, comfortable, and full of mind numbingly unique, complex and delicious beers. If I lived in Portland, I have little doubt that I would go completely bankrupt because of this place. No matter where you live in the world, consider it an absolute, 100% can’t miss beer location. Go there, you will thank me. I’d also be insane if I didn’t mention that the staff is crazy knowledgeable and super nice. The world’s biggest high-five and a heart-felt THANK YOU goes out to Cody for EVERYTHING that he did for us. Our gracious host. Thanks again Cody!